In August, the U.S. District Court for the District of Columbia invalidated a Federal Election Commission regulation allowing donors giving to groups like Crossroads to remain anonymous. The decision affects third party groups advocating for or against candidates for the U.S. Senate and House seats. This fall, all of Michigan’s U.S. House seats and one of its seats in the U.S. Senate are on the ballot. Craig Mauger is the executive director of the Michigan Campaign Finance Network. He calls the decision a rare victory for transparency. But Mauger also expects groups that handle so-called dark money will continue to try to work in the shadows. “The groups that want to anonymously affect our elections will try to find ways to continue doing that,” says Mauger. Mauger expects dark money groups will shift their anonymous campaign donations to state races where they can continue to keep their donor list secret. Also, so-called issue ads that are often thinly veiled attacks on particular candidates are not covered by this decision. Democrats are hoping for a “Blue Wave” in state legislative races in November. But Republicans are seeing a “green wave” of campaign donations. 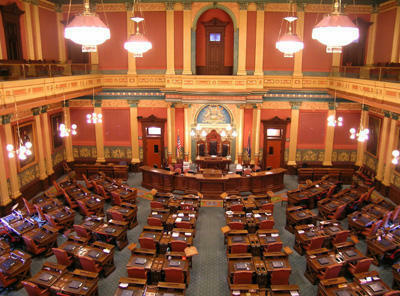 This year’s mid-term congressional elections could be the most expensive ever in Michigan. The Michigan Campaign Finance Network reports the 30 candidates running in Michigan’s 14 congressional districts raised $14.7 million as of the end of last year. And the money keeps rolling in. The network’s Craig Mauger says Democrats are benefiting from donors wanting to defeat Republicans and derail President Trump’s agenda. Forty-seven states require lawmakers to disclose finances. Michigan does not. Should state lawmakers be required to file financial disclosure statements? Something to let constituents know if there are potential problems, conflicts of interests? There are 47 states that agree they should. Those states have some law on the books requiring legislators to file some sort of financial disclosure statement. The three exceptions are Vermont, Idaho and Michigan.